Have you checked your fire doors? Fire doors are designed to prevent the spread of smoke, flames and toxic gases throughout a building in the event of a fire. Therefore, when a fire door is held open, or is faulty, fire can quickly pass through the building, blocking escape routes and endangering lives. 1. Check the door’s hinges. Are they CE stamped and do they fit correctly? 2. Check the correct fire signage is displayed. 3. Check your door holder/closer device. Check it works, and check that it does not need updating. 4. Check your locks and hatches are CE marked and not damaged. 5. Check that the seals and vision panels are free from damage. Legally, a building’s fire doors must be self-closing to ensure the door closes to act as a barrier that stops the fire from spreading. It is recognised that it is sometimes necessary to hold fire doors open for practical reasons e.g. easing access, increasing ventilation. 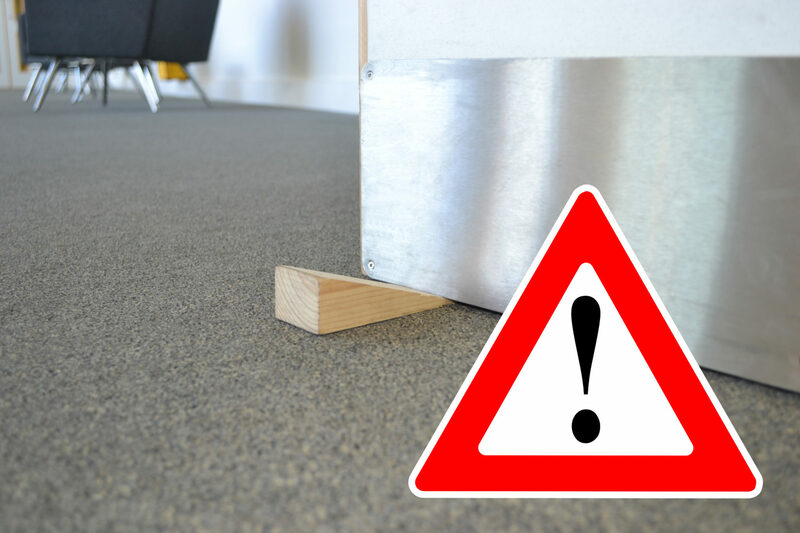 Wedging open fire doors with a wooden wedge will put the people in the building at risk. The door will not automatically close if it held open this way. If you want to hold the fire door open, it must have a device installed to release the door, so that it will close upon activation of the fire alarm system. Fire door retainers such as the Agrippa magnetic fire door holder are fitted hygienically to the top of the door and use a magnet to hold open heavy fire doors that will release in the event of a fire. This is not a comprehensive list and further advice should be sought directly from your fire door supplier to ensure your fire door is fully safe and compliant. We also advise you to view the Fire Safety: Approved Document B. Which covers building regulation in England covering fire safety matters within and around buildings. The Agrippa fire door closer is fitted in place of a traditional door closer to hold the fire door open in any position, whilst ensuring the door will close in the event of a fire. Fire safety is a vital consideration for any business, large or small, which protects your employees and your building assets. Enter your email address and we will send you details of our products and industry news.